A cold night in space. Here you are again, trapped on another testament to Man's inability to stay safe. This time it's called the Moon Base they called " unexploded-able," also known as the beleaguered Moon Base Copernicus. Moon Base Copernicus is. of course, about to explode. And there's only room for two people in the last escape pod. It's no secret that you hate old Doctor Lucky, especially considering your frequent attempts to kill him. But you've decided to take him back to Earth anyway, because without his help you're never going to inherit his ancient collection of interesting magazines. Save Doctor Lucky on Moon Base Copernicus is an expansion for Save Doctor Lucky, which is a sequel to Kill Doctor Lucky. 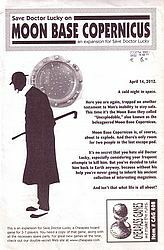 Now you can try to keep the old man alive on the beleaguered Moon Base Copernicus, the moon base they called "unexploded-able." The expansion includes new features like TV monitors, force fields, and rocket tubes, and new rules for drawing cards and destroying boards.